We all face power cuts in our houses or offices some time or another. At those times we generally use Generator or an Inverter. Power generators use petrol or diesel as fuel and they are noisy. We will not be discussing about the power generators here. Here we will be talking about the Inverter. Inverters drive the power from DC power banks, like lead acid battery pack. These inverters are used everywhere now. This type can be used for medium power applications. But for high power appliances Power generators are most preferred one. The most common type of inverter we see in everyday life is UPS (Uninterruptible Power Supply). We use UPS to keep PC (Personal Computer) running in the event of power cuts. UPS keeps up the power delivered until battery bank runs out. UPS is a system which converts DC to AC. So, UPS takes DC power of battery as input and gives AC power as output. Today we are going to build a 100 watt 12v DC to 220v AC inverter. This Circuit is simple and very useful. IRF540N MOSFET should be used with heat sink, do not use the MOSFET without proper heat sink, without them the MOSFET cannot stand. The MOSFET here is n channel enhancement MOSFET. Also use some good gauge wire. If you use small gauge wire, you will have losses and under heavy loads they become immensely hot and they will burn out. Circuit diagram of 100 watt DC to AC inverter has been given below. We have used EasyEDA to draw this Circuit Diagram, and covered a tutorial on ‘How to use EasyEDA for Drawing and Simulating the circuits’. You can also covert this Circuit Diagram into PCB layout, as we have explained in EasyEDA tutorial, and build this project on PCB. Now to get frequency (1/T) of 50Hz, we need to play with the above numbers. We can choose capacitance as a constant and play with resistance for appropriate frequency. But if you don’t have an oscilloscope to adjust the pot for the exact resistance, choose capacitance as 4.7µF and resistance as 1KΩ. This gives a frequency of 47Hz, which would do just fine for simple loads. If you want to get exact frequency you need to select the resistance accurately. 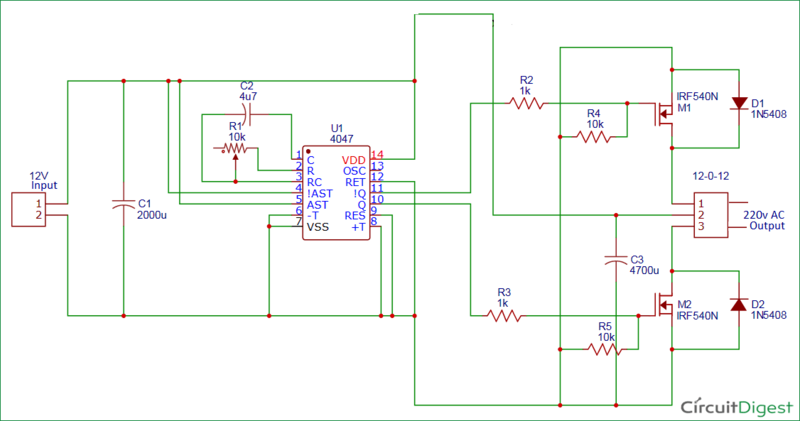 So the chip generates the clock pulses, these pulses are taken to N-MOSFET to drive the transformer. The transformer steps up the 12V to 230V. So every time a pulse reaches the MOSFET gate, we will have a 220V half cycle at the output. In the next pulse, the second MOSFET triggers for the second half cycle of 220V. So with two MOSFETS turning on and off at 50Hz frequency, we will have 50Hz 220V cycle output at the transformer end. So we have made a 12V DC to 220V AC Inverter Circuit. very useful circuits thank you dear. It is a good and very useful please send circuit diagram and other details regarding inverter. Am grateful for this project because we tried it out and it has worked out for us. I want to use this circuit to build a 400 W UPS for my PC. How do I upgrade the 100 W circuit to 400 W please? Which components should be changed? 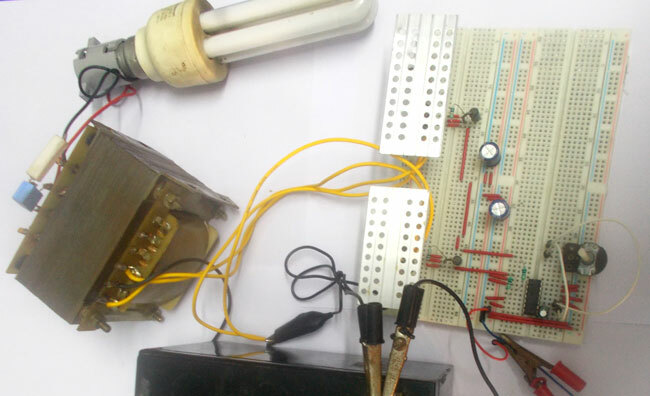 i made this circuit completely at the end output is coming without putting transformer which is 25 volts AC but when i put transformer its output is not coming and battery is getting hot instantley. what to do i am facing very much trouble please leave a note to overcome this problem. square wave is coming out of pins in 4047 . i checked it on oscilloscope . every thing is fine ac is coming but when putting transformer to step up it is making problem. Is this inverter sin wave or square wave? This 12v DC to 220v AC Inverter Circuit comes very useful during my search. have you connected any load on the output side? How much voltage are you measuring?